The Kershaw Pub is a compact multi tool designed by Dmitry Sinkevich. This Kershaw Pub Knife features a 1.6" non locking modified sheepfoot blade made of 8Cr13MoV stainless steel with a stonewash finish and a notched thumb rest for secure grip. The stainless steel handle has an integral bottle opener and screwdriver / pry bar, a blue aluminum front scale, a strong detent to hold the blade in the closed position, and a large key ring attachment. (To open the knife, push down on the notched area of the key ring attachment.) 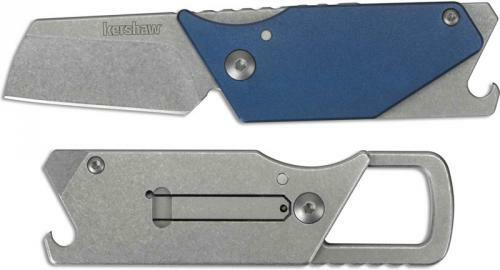 The Kershaw Pub Knife has a closed length of 3.1", an overall open length of 4.5", and it weighs 1.9 ounces. I bought the Kershaw Pub Knife because it just looked cool. I have a boatload of knives but nothing quite like it. I carry it on my backpack, so the carabiner is great. The sheepsfoot blade also is great, I dont need a "sticking" knife for the types of cutting I generally do. I bought it in blue so it wouldnt disappear like many of the black handled knives I have do. Some cons: The bottle opener requires a push up rather than a push down, so its a bit awkward. Though the screwdriver is great for opening cans of beer. Lastly I find the knife handle when opened to be short. I have small hands and this is still somewhat difficult to get a grip on. I have to be careful when extended as my index finger touches on the blade. All that being said this is a fine EDC at a good price, and other than the handling this is just fine as an extra utility knife for light cutting. Great little blade for opening packages and the like. Carries well on the keychain. I wish it locked, but then again part of the appeal is I can take it places locking knives canâ€™t go. Would buy again. Bottle opener works well, but takes a little getting used to. I bought these for hanging out this summer in shorts but still having a way to pop open bottles and maybe cutting a line or two. They hang nicely on belt loops and seem to be safe enough even though they don't lock. Cheers! !